Babies need as much rest and sleep as they can to support their growth and development. Hence, you need to make sure that your baby can sleep calmly and comfortably. Organic baby mattresses are great because they do not merely allow babies to sleep well, but they provide a healthier sleeping environment, too. Organic mattresses are made of authentic natural Dunlop latex, which is firm, durable, and provides a sleeping surface that is even and supportive to baby’s developing and growing limbs and bones. Hence, babies can sleep comfortably and soundly, and you do not have to worry about deformities and chronic pain, which can be caused by a low-quality mattress. Organic baby mattresses are extra firm and made with a 100 percent organic cotton top layer and high-quality natural wool, which is a natural flame retardant. This means natural mattresses are not treated with toxic flame retardants, which could off-gas and increase your baby’s risk of developing cancer and respiratory issues. 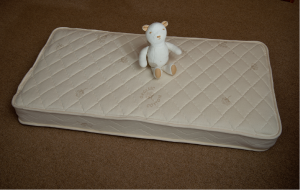 Organic baby mattresses are made of natural materials that naturally repel dust mites and prevent moisture build up. Natural Dunlop latex lets air circulate around the mattress to allow perspiration to dissipate quickly to prevent mold, fungus, and bacteria from thriving and causing health problems. Natural wool regulates the temperature around your sleeping baby by keeping the body warm every winter and cool every summer. Changes in humidity will not damage the mattress, as natural rubber is denser and more durable than conventional synthetic mattresses. Organic wool in baby mattresses are hypoallergenic like organic cotton because they still have their lanolin. The ingredient is a natural dust mite repellent, but it can be stripped away when the fleece is doused in harmful chemical treatments and bleach.